Frederick, Maryland doesn’t have too much to worry about when it comes to floods, but they do happen. While the city enjoys Maryland’s mild winters and sits far from any major rivers, hurricanes and tropical storms will occasionally drop a dozen inches into the local water supply in a matter of hours and flood the parts of town that sit closest to Monocacy River. Overall, 11 percent of Frederick sits in a 100-year floodplain. This potential for flooding is why a lot of buildings in Frederick and beyond don’t have basements, but of course another reason is because not every homebuyer can afford the extra cost that comes with adding an extra floor underground. Instead, many homes come with crawlspaces, a couple feet of space which sits between the foundation slab and the floor itself. Having this space makes it easier to keep the ground floor warm in winter months, and it makes it easier to access the ducts, pipes, and wiring which run beneath the floor. Of course, a flood isn’t the only way to wind up with a wet crawlspace in Frederick. 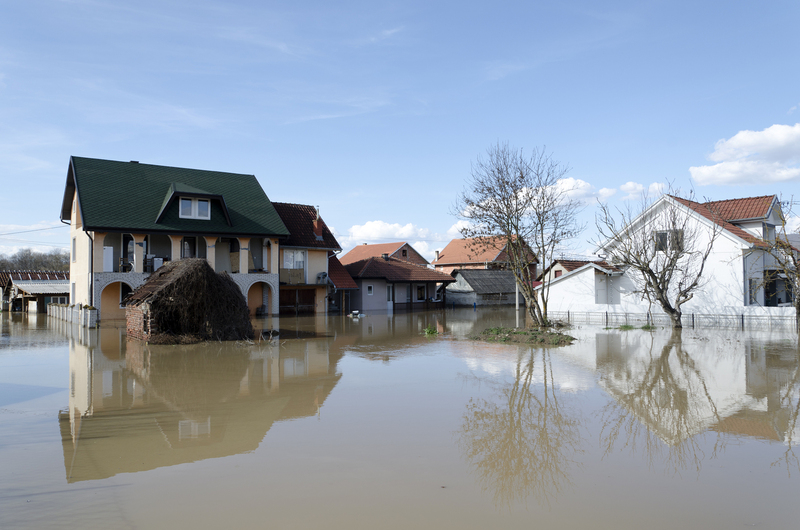 Even normal rainfall can do significant damage to an unprotected home over a long period of time, which is why so many aspects of building construction are about how to keep water out and how to keep it away from the foundation. That’s why homes don’t just have waterproof roofs, they also have eaves and gutters to direct rainfall a safe distance away from the base of the building. At the ground level, home builders will surround the foundation with large stones let water easily seep through and which resist the small but powerful movements of the surrounding soil. If this system isn’t installed correctly, or if it stops working, water can seep into the basement or crawlspace, causing both physical damage and inviting in mold, silverfish, and other pests. You also have to consider the humid Maryland summer. Crawlspaces are rarely sealed off from the outdoors the way the inside of a house is, which means it gets just as humid. Water is absolutely necessary for life, but some particularly tenacious lifeforms like mold can survive on nothing more than the moisture in the air. In other words, then, even if your home is completely up to code, you may have a mold problem in your crawlspace. An excessively humid or outright wet crawlspace in Frederick comes with a few problems. There’s always the worry that termites will set up shop and permanently lower your property value (since even when they’re gone they’re rarely gone for good), but even mold in your crawlspace is bad. Mold spores are microscopic, and they have ways of spreading through even the smallest of cracks into the rest of your house. Some species of mold are mildly toxic to humans, and the symptoms of exposure are very similar to those of a cold: a runny nose, sneezing, and coughing. While this might not sound too bad, it can be a serious health risk to the very young, the very old, and the sick, and even if you’re in perfect health it can turn staying at home into an unpleasant experience. Fortunately, there are ways to improve your situation. If you have a wet crawlspace in Frederick, or even if you just want to turn your crawlspace into a safe, dry place you can use for extra storage, you can contact AA Action Waterproofing. For around 30 years now, we’ve been waterproofing basements, repairing foundations, and encapsulating crawlspaces. Encapsulating a crawlspace means sealing it away from the elements just as thoroughly (or even more so) as the rest of your house. This means installing a lot of waterproof, insulating materials as well as a filtered grate for air circulation, which is why it’s a job best left to the experts. We can also remediate your mold problem and check for other pests at the same time. Whether you’re dealing with a wet crawlspace in Frederick or a leaky foundation in Silver Spring, AA Action Waterproofing is your best bet when it comes to basement, crawlspace, and foundation woes. We serve communities throughout Maryland and the surrounding states, so if you live in our area and you need some expert waterproofing assistance you should call us today and schedule a free, no-obligation inspection and estimate.